Today we are having Alexey Suraev and Denis Peshev, as our guests. These two are our old friends, who love to meet for a cup of cofee and discuss games. And they are so facinated sometimes, so we decided share with you one of their recent conversations. AlexxW – a fanboy, who is into pretty much everything. Prefers playing, to thinking. Irokez – a sceptic, used to critisize everything he is playing. Thinks through 10 turns before making a move. 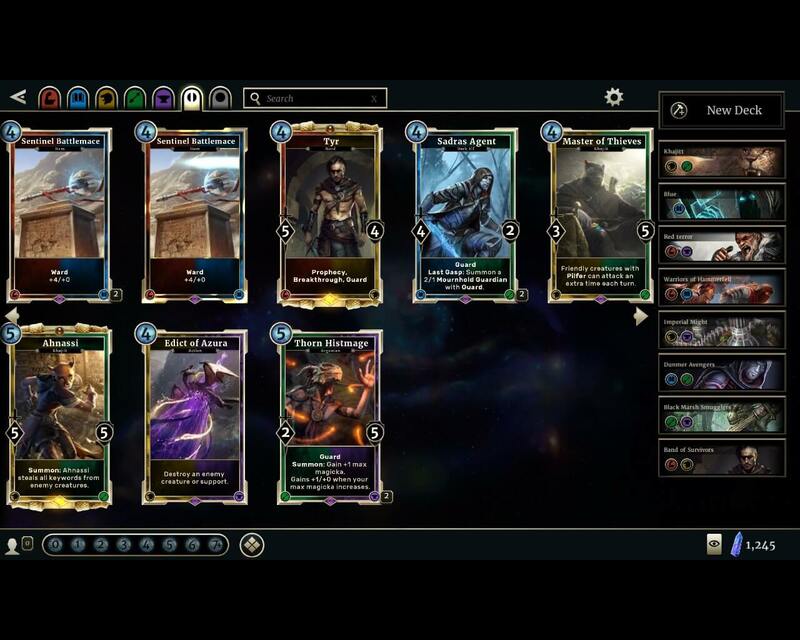 We would like to share our fellings about a new strategy card game from Bethesda — The Elder Scrolls: Legends. It’s based on Elder Scrolls universe (surprise! ), known by such games as Morrowind and Skyrim. Cards here depict representatiives from different races and famous charachters of the universe. Let’s start from afar. I hate Hearthstone and there are many reasons for that. Some of them are objective and some are personal. But this hate has been growing since I found Blizzard’s way to approach card games genre. 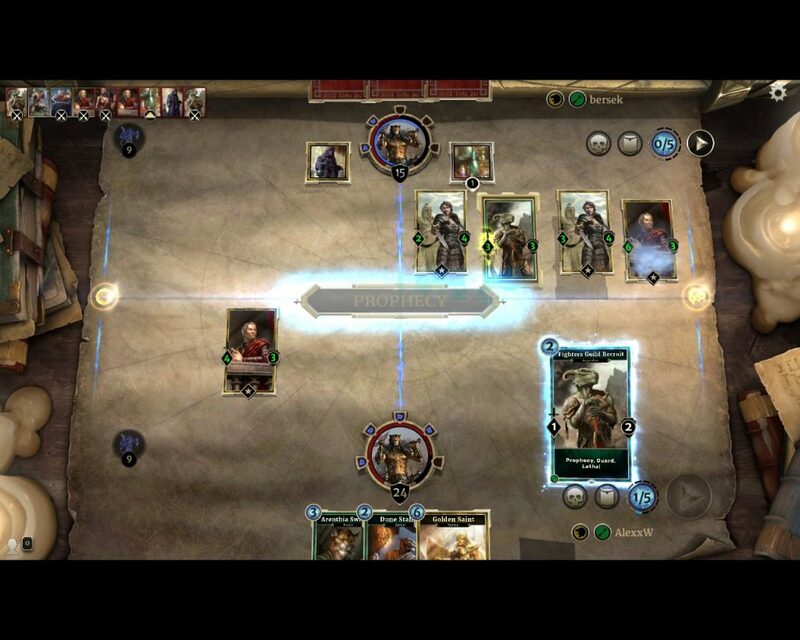 I’d hate to say this, but first thing you see, launching The Elder Scrolls Legends is Hearthstone. The game isn’t even trying to hide it’s source of “inspiration”, but nevertheless, it’s not a bad game. It would seem like playing on a foreign turf, but at a closer look one can notice that most elements are at the same place, looking different, working different. That’s what makes the game different itself. True, many people just can’t live with Hearthstone’s success, so they’re trying to reach it. Sometimes it’s hilarious: some Asian countries have HS clones with anime-girls arts, and some are even trying to make a paper version of the game. On the other side, there are games like Duelyst, that take HS mechanics and transfer it to a tactical battlefield. So the devil is in details, as usual. So why not dive into them? What I can’t stand in Hearthstone is missing borders between the Horde and the Alliance. From now on, there is no separation into reds and blues. Anyone can take any creature from both sides into the deck. It really hurt my feelings, as I’ve been going with the Horde since I first saw Warcraft II in 1997. I haven’t seen this problem in Scrolls. To be exact, there is no such problem in the original series. Players can always meet an Argonian or a Khajiit in snowy mountains. There is a thinner saparation. Each race here has a cartain style of playing, so the race usually has two colors (for example, Khajiit have green abd yellow, Argonians – green and purple). Here we are surprised to see find one of the most popluar board games – Magic the Gathering and it’s colors. Red, Blue, Green, Yellow and Purple. Even the color-gameplay was carefully transfered. Gathering the deck, players are limited with two colors by wish. In most cases, those will be 2-3 races, that make the foundation for the deck. 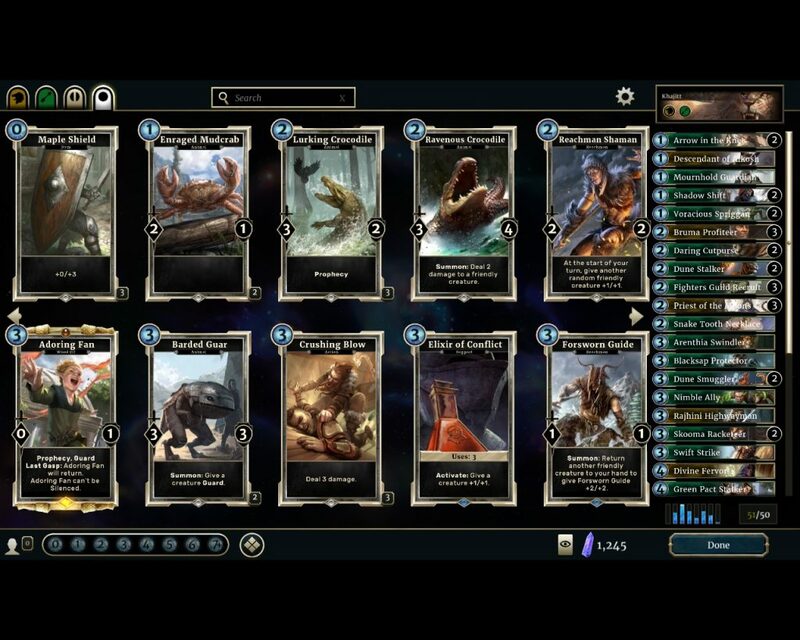 So it seems like players get quite a themed collection of cards during the deckbuilding. This way of creating a deck works for me well. Limitations are quite weak: not more than 3 same cards, decks are 50 cards and more. Those limits work for me and my style (which is to put all cards I like into one deck and work on them afterwards). But these limitations don’t work so well for players pouches, as there are more resources needed in order to get a deck. Developers are compensating this with better awards for battles and arenas, but in general, deckbuilding is deeper and demands more decsisions, than HS. Speaking of deckbuilding, rune mechanics is also to be mentioned. 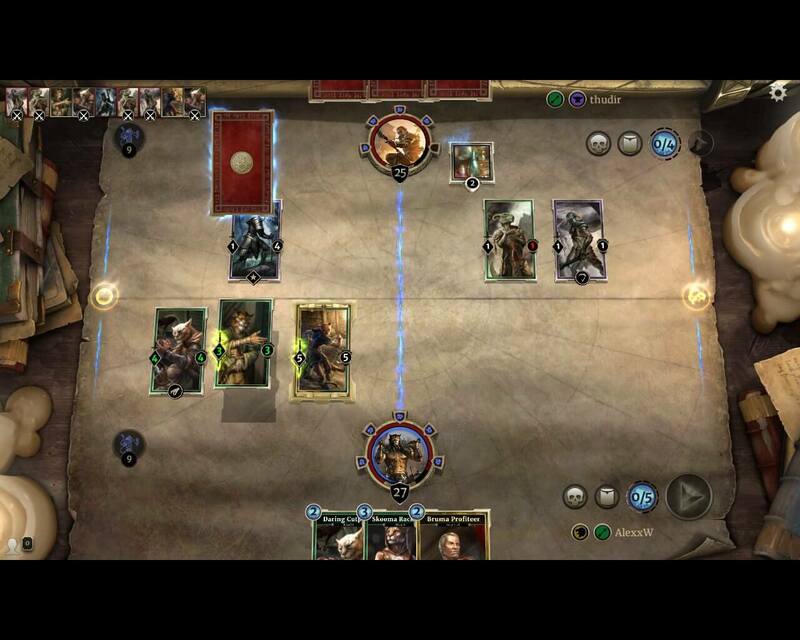 Each of five damage points that player gets will break a rune and the player is to pick a card. In case, if a card has a key-word Prophecy, it can be played for free (even during the opponent’s turn, when you will lose a rune). Prophecy cards are either weaker to cost more than other cards, so a handfull of them will weaken the deck. On the other hand, a free removal of a creature-protector, played during the opponent’s turn can even save the game from some red agro sometimes. It’s important to pay attention to such things during deckbuilding. Prophecies also touch upon the weakest point of online card games – their interactivity. When you can always say: “Hold on, I’ve got a return action” in a board game, online can’t give us such things easily: constant priority shifting lose the pace and make the game last longer than it has to. That’s why most card games don’t have this opportunity or should not have. Prophecies is the least such feature that is realized in more or less adequate manner, though natural happenstance give a grim face from time to time. Indeed, there is a big happenstance in getting a prophecy card. On the other hand, the fact that a broken rune gives a card to an opponent and even a chance to play it, holds the agression, making a way to get powerful expencive cards. One of my mistakes was to break 2-3 of opponent’s runes too early, which gave them a good advantage in cards and help in winning the game. And only laziest ones didn’t talk about flanking system. There are two flanks that do not interact with each other in almost any way, which gives a necessity to plan on what creatures to take in each of these sides. The story mode and PvE-arenas can give additional peculiarities (for instance, each cost-5 or above creature on the flank become protectors automatically). These qualities are to be taken into consideration in order to win, which adds diversity and pleasure. I can tell you about flanks in details. The board is separated into two sides vertically. Each side can have four creatures from each side. Flanks are always the same in PvP: light (without additional qualities) and dark (a creature put there obtains a cover fro one turn and it can’t be attacked.) Creatures cen attack only their enemies of the same flank. Many mass effects and Guard ability works only on one flank. If the flank is full, a creature can still be put there, but this will kill one of your soldiers there by choice. All this adds another layer of tacktics to the gameplay. PvE-modes is an undoubtable profit. Stroy-mode is basically a tutorial, that lasts for about 20 battles and has short describing videos on the plot of the battle. This mode helps us to open starter decks and a pack of additional cards for them. 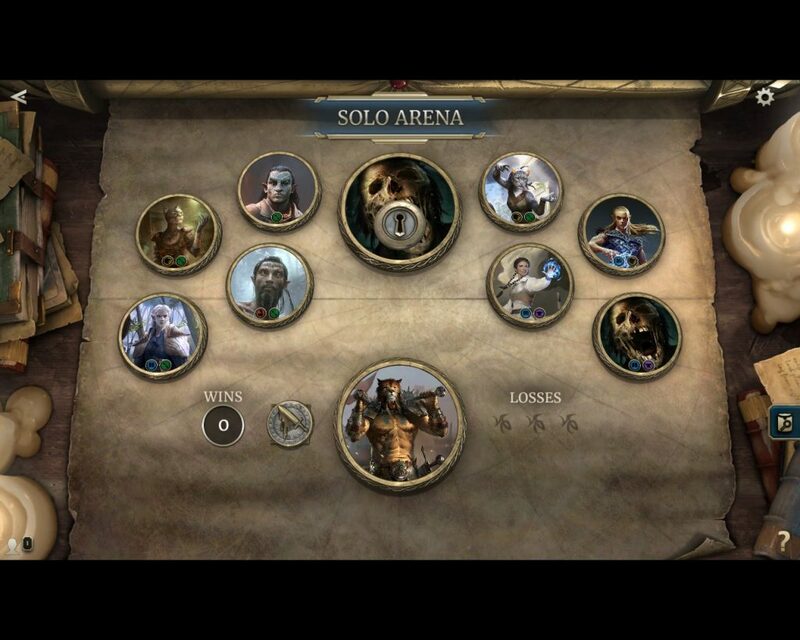 The second one is Solo Arena for single player, as one may gues by the name of it. 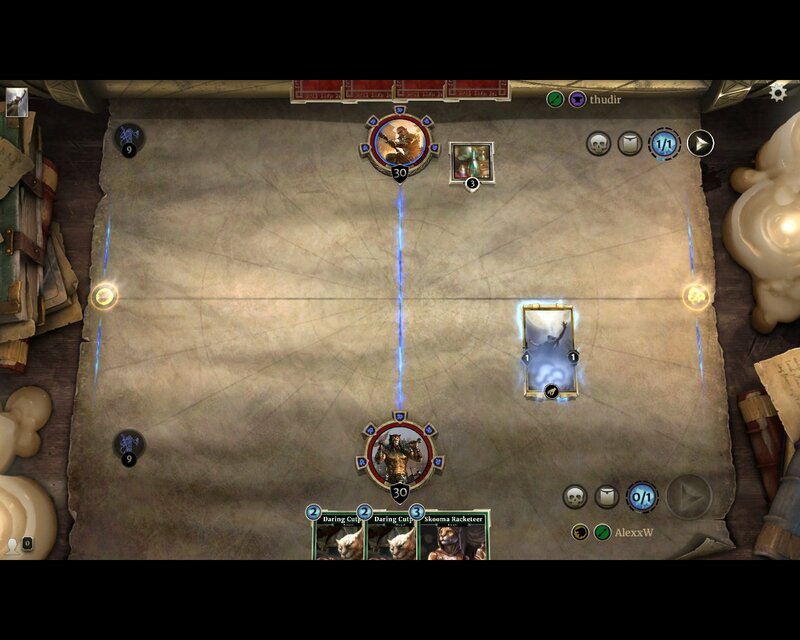 A player gathers a deck of 30 cards on basic principals of the arena, after which he has to defeat 9 opponents. After that, peculiaritires appear. First, every battle has it’s own rules. It’s either specific flanks of additional cards for one side during the first turn. 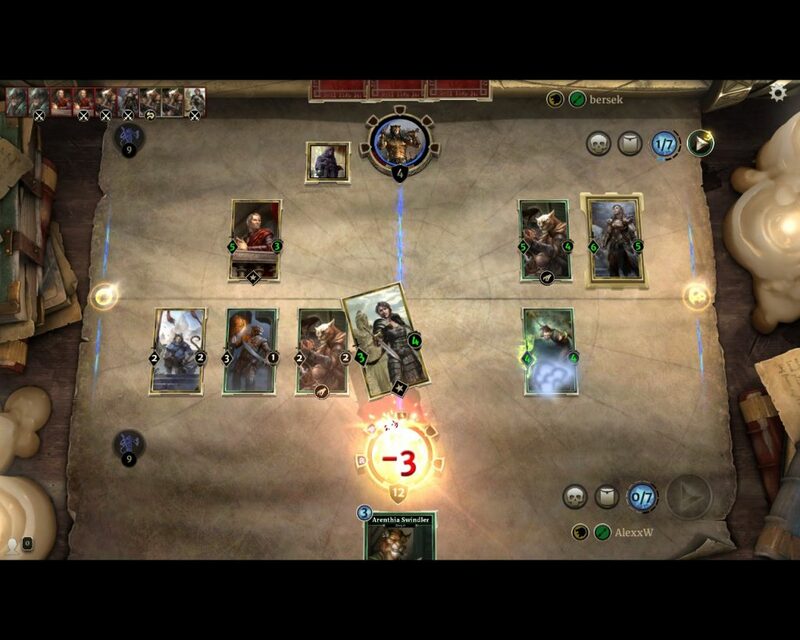 Second, after two or three arenas, opponent’s cards become not very “arenish”, so players have to think very carefully, if they want to win the game with an “AI dummy”. Just like in the common arena, there are 2 times to lose given. 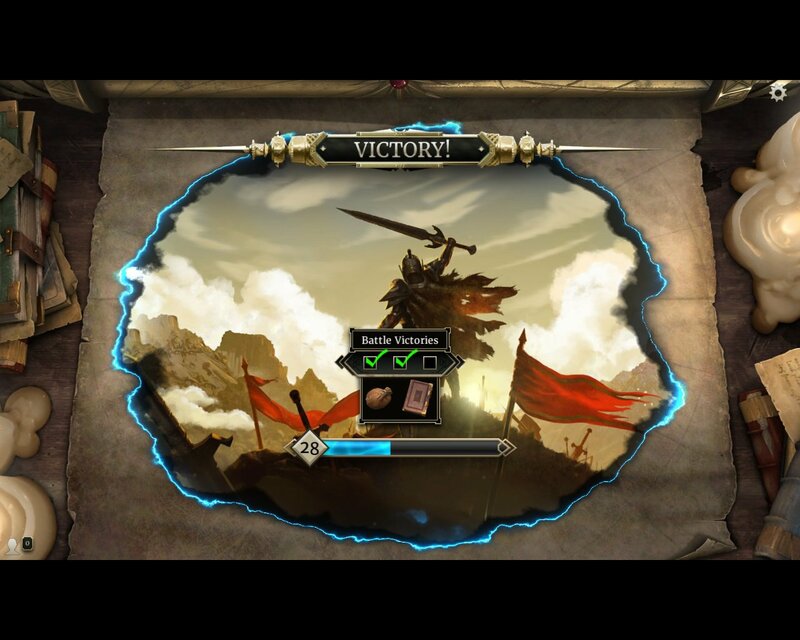 However, after each win, player gets one more card by choice in the deck. As there is no live opponent, players are always able to save their progress in case of a connection break or anything. This also gives a chance to think the action through, without a timer. The game is interesting in general. So interesting, that I managed to gather a decent deck on arena and get to the legendary rank within a week. Beta-test is going well. Bugs get fixed, breaks get nerfed (two cards in my deck are already nerfed). Pros are: good tactical gameplay and deckbuilding. Cons are: the secondariness of main game mechanics, inexpressive premium-gold cards design and an uncomfortable menu (though this to be fixed, I guess). To my opinion, the game is trully intriguing. A can’t boast of my victories, as there is not much to boast of, but I feel lack of co-op mode, pretty much like in most online card games. 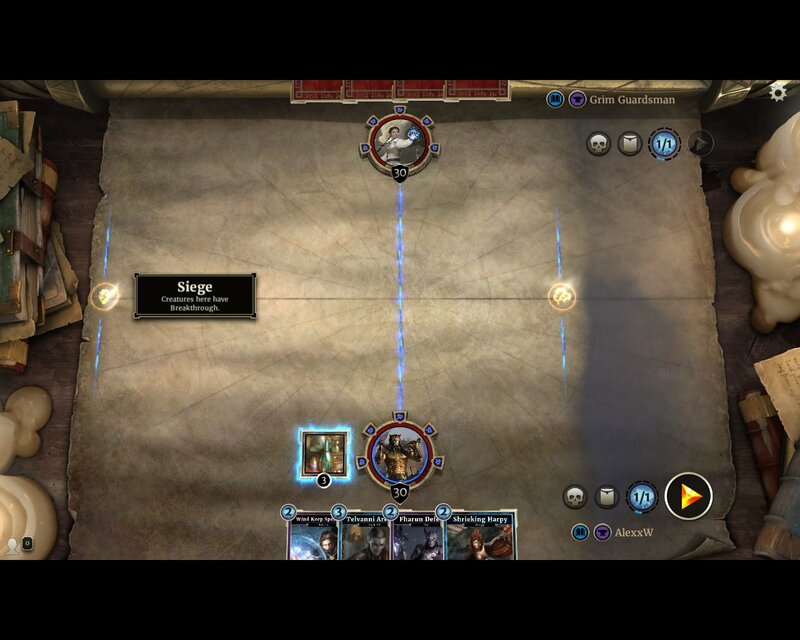 There is a hope for that, as The Elder Scrolls is not simply copying Hearthstone, but it makes a mistake correction, expands the game. There still is a couple funny elements in the game that should be seen personally. The game is worth trying at least. 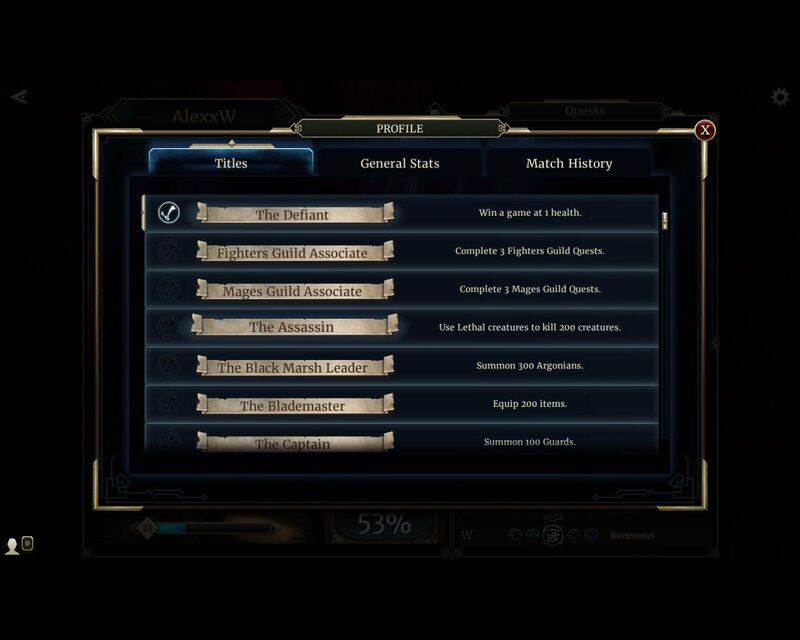 We thank our friends for the dialogue and a thorough description of The Elder Scrolls: Legends. We assure you, that we will meet them again!